The Ridge, Hole, 10 A new member at Predator Ridge, Jill Douglas is a survivor. She lived through the crash of a small plane when she and her husband were flying back from Tofino. Her husband died in the crash. To get to know Jill, one needs only to read the book she subsequently wrote about that ordeal titled My Plane Truth. No pushover on the golf course, at one point in her life, Jill played for each of the BC, MB and Canadian Junior Girls teams. 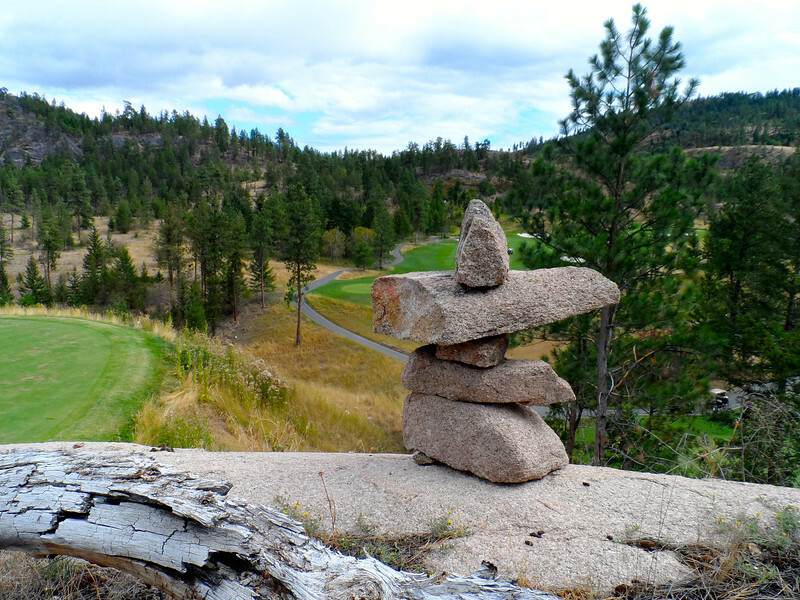 Jill likes the inukshuks and when she heard they would be named after people who did something special on a hole or for the resort, she immediately rose to the challenge and eagled both #4 and #10. Eventually, the news was broken to her that she could only have one, so the one on hole #10 is hers. Inspired by the true meaning of an inukshuk, Jill asked if one could be built at her home that would both tell her story of survival and also reflect her background as an interior designer. It sits at the entrance to her domain.